The fundamental frequency is an important characteristic of speech signals. Most energy in voiced speech utterances is carried by the harmonics, which are located at integer multiples of the fundamental frequency. 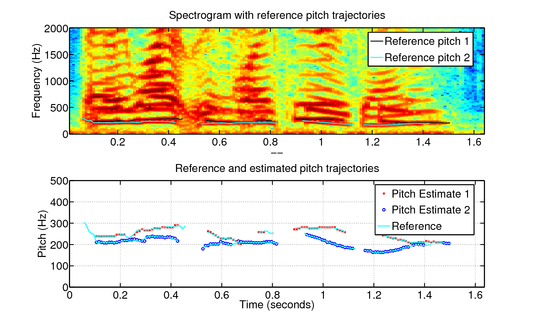 Estimation and tracking of pitch is an important and ongoing research area in speech and audio over the last decades. Several well performing methods do exist for the case of a single speaker in well controlled environments (i.e. no back ground noise, etc.). For the case of several speakers talking simultaneuosly, however, estimation of (multiple) pitch values from monaural recordings is a more challenging scenario. Top panel: Log-Spectrogram of two speakers together with reference pitch trajectories extracted from single speech. Bottom panel: Estimated pitch trajectories, together with reference. Estimation is performed with speaker dependent models. Red and blue points are respectively assigned to speaker 1 and 2.